Sparks flew at a Judiciary Vs Executive debate on the NJAC judgment hosted by TV Channel Times Now and moderated by famous news anchor Arnab Goswami yesterday evening which saw high-profile participants sharply divided on the collegium system of choosing judges with even its supporters admitting that it has some faults and needed reform. Finance Minister Arun Jaitley continued to criticize the judgement but made a remarkable climb down from his “tyranny of the unelected” statement and hints of taking on the judiciary by saying “the SC has rightly or wrongly decided. The judgment will be complied with. The NJAC is dead and gone but debate for a better system for appointment will continue”. Former CJI R M Lodha and jurists Soli Sorabjee and Rajeev Dhawan supported the judgment but felt there was need to correct the flaws in the system of judges appointing judges. The debate will be telecast by the channel at 9PM tonight. Jaitley said “ SC was constitutionally empowered to strike down a constitutional amendment. My ‘tyranny of unelected’ comment was meant against the deep distrust of politicians shown by the judges. My criticism was against the premise of the judgment that politicians could not be trusted and the judiciary needs to be protected from elected representatives,“. Interrupting Jaitley, Justice Lodha said he could not believe the “tyranny of the unelected“ criticism coming from Jaitley. “Had such a comment came during the years leading to Emergency , one can understand. I hope no one wants a judiciary where the appointment takes place if the concerned person knew a politician,“ he said. Justice Lodha conceded that the collegium system had its flaws. “The system is opaque and secretive. There is lack of expert evaluation of merit of a candidate,“ he said. 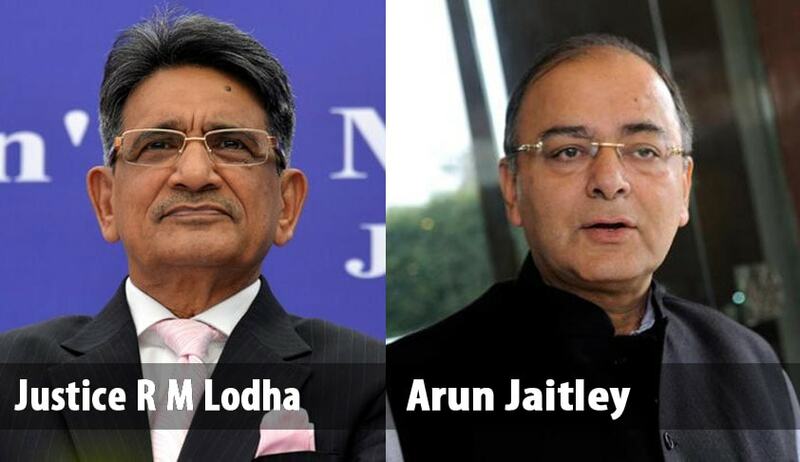 Jaitley countered Justice Lodha by citing how the judi ciary made appointments in an adamant manner. Pinpointing flaws in the collegium system, “One person was recommended for appointment as a judge of the HC by the collegium. I as law minister and then PM Atal Bihari Vajpayee returned the recommendation. But the collegium within 24 hours reaffirmed the recommendation. When it was sent to (then) President A P J Abdul Kalam, he returned the recommendation with strong comments. Yet, the collegium again reaffirmed the recommendation. The person was appointed as a judge. But within two years, the man showed his true colours and the collegium was forced not to confirm him as a permanent judge,” Jaitley said. Justice Lodha said while he respects the executive, he was of the view the judiciary has to be insulated from political interference or pressure, and added that interference by executive has to be nominal. Justice Lodha said though the NJAC Act has been set aside, it was still open for the executive and the legislature to devise an alternate method of appointing judges. Opposing the collegium, Jaitley said it was full of flaws and while the nation needed an independent judiciary, its credibility was more important. To be independent is important. To be credible is more important. We all know there was a CBI Director who was independent but not credible, he said. Jaitley questioned the exclusivity enjoyed by the judges who appoint judges without any interference by the executive, saying the collegium system was akin to the Gymkhana Club here where members appoint the future members. He also said that the executive always participated in the process, but its comments were never taken seriously. It (collegium) is a de-facto system where executive has to follow what the judiciary says. It is a clerical role that the executive has, the minister said adding that there should be a system of checks and balances. The minister contended by its judgement the apex court has re-written the constitution as it does extreme damage to sovereignty of the Parliament. Backing the verdict, Dhawan said it does not affect Parliament's sovereignty as it does not have sovereignty but is supreme in its sphere. Sorabjee, a former Attorney General, supported the view of Jaitley and said that judges should have an important role in the appointment process but not an exclusive role. “Why do you want to arrogate the power (to appoint judges) to judges only? Sorabjee said. He said that Justice Kurien Joseph, who was part of the five judge-bench, which delivered the NJAC verdict, had castigated the collegium system by saying that various deserving persons were ignored while several undeserving persons were included. Sorabjee said that instead of striking down of the NJAC Act, the apex court could have read into it that eminent persons, who would be part of the NJAC, should be those who belong to the field of law. On the objection to the inclusion of the Law Minister in the six-member commission, he said the minister was not a pariah. Dhawan, who had appeared in the apex court during the NJAC hearings, countered the views of Jaitley and Sorabjee and said the problem with the NJAC was that it had some design faults, one of them being that it consisted of six members. Another fault that he felt was that the two eminent persons or the law minister and one of the eminent persons could stall the appointment of a judge, apart from also impacting upon the primacy of the judiciary and the Chief Justice of India in appointing judges. This view also received support of Justice Lodha who also said the NJAC in its current format could stall appointment of an independent judge. Another threat to independence of judiciary that was feared by Justice Lodha, with which the other three agreed, was the issue of post-retirement jobs that judges get. Pre-retirement judgements are influenced by post- retirement benefits, he said and suggested a method to counter it. He said that three months prior to retirement, judges can be given the option of choosing between receiving pension or a full salary-job. If they opt for the former, then they would be disqualified from being considered for post- retirement work, he added. However, if they opt for full salary, then their names would be made part of a panel and when a statutory vacancy comes up, which requires a judge of a high court or the apex court, then someone from these judges can be selected by the executive in consultation with the Chief Justice of India. Justice Lodha and Dhawan said judiciary's role was much different from that of these statutory bodies. They said that the judiciary was the institution which was called upon to decide matters like coal block allocation, 2G spectrum allocation, life and liberty issues as well as the constitutionality of certain provisions of the Representation of the People Act and it cannot be compared to other statutory institutions. We need a strong and independent judiciary, they said.